Perfect for households with a passion for entertaining, the innovative FlexSpace interior allows you to customise the fridge’s internal compartments to suit your specific needs – ideal for fitting large platters and bowls when catering for guests. 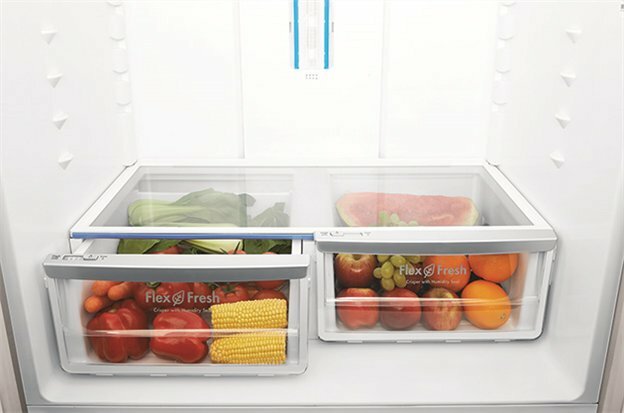 The FlexFresh crisper and FlexStor door shelves also bring a new standard of versatility to the Westinghouse range and are perfect for organising clutter to make the absolute most of your fridge’s space – a great asset that comes in handy after grocery shopping. Boasting a luxurious 605L capacity whilst remaining remarkably streamlined in size, the WHE6060SA is compact enough to fit into a conventional 90cm wide cavity – making this a truly forward-thinking family fridge designed for modern metropolitan living. Featuring the ergonomic convenience of a classic French door configuration, this fridge from Westinghouse represents a complete refrigeration solution for contemporary families looking to maximise their use of space, time and energy. Hi, We are happy with the fridge. However, had we known that the water chiller was not a continuous chiller, we would have purchased a different model. I think Westinghouse have misconceived their customers. By what I have seen on their website, I'm not the only customer to feel this way. I bought in December and was the perfect fridge. Lots of space and fits in a small space! Ice machine is great!! I bought this fridge for our brand new home. It is a great fit and looks stunning in our new kitchen. We also love the chilled water feature! The filtered water tastes great which means we are actually drinking more water and no longer need to purchase expensive bottled water. Thanks also to Appliances Online for such a fabulous price.and may we say your team were absolutely fantastic! We have had this fridge for about a month , and are very happy with the service and price from appliances on line.The fridge has performed beautifully during this hot summer. The auto ice maker and cold water are really appreciated. There are no issues to date with loose or flimsy handles. The kids are jealous and want one. The freezer drawer handle keeps falling off. 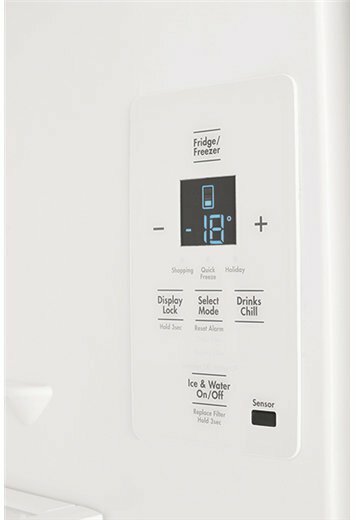 overall it is a great fridge and your service was excellent. I bought this fridge just over a month ago and love it. Great features..wine rack, crisper very effective as my veges seem to now have a longer shelf life, freezer well designed and stores heaps. Loving the water dispenser and the icemaker as well!!! Doors provide lots of storage for jars. Probably the best feature is that it is made for that 90cm Fridge space and it fits like a glove and foesn't protrude too much into the room! Easy to install, switched on immediately, great internal lighting and diagnostics. Doors not hanging straight, and even after support came to sort it, still not perfectly happy. And worse is, after a month, the handle of the freezer drawer totally snapped off. I'm still waiting for that to be fixed. 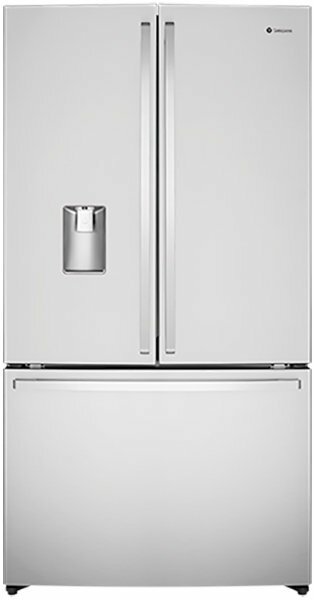 I purchased on 22/1/2018, from Appliances on Line a brand new Westinghouse French Door Fridge model #WHE6060SA cost $2053.00 That night the handle on the freezer drawer came off and scratched the stainless steel door and also caused a small cut to my shin. I rang the next day, they said as it was within the 14 days of receiving a new fridge they would send out another replacement new fridge. A Frances Covel @ winning.com.au from Appliances on Line rang me to say they would compensate me with $150 and she said 'don't expect any more as this is all your going to receive'! This new fridge arrived on the 25/1/2018. But when it was delivered the delivery fellow tried to remove the freezer drawer with the dent and replace it with the door on the new fridge waiting to be installed sitting gin the truck. But he wasn't able to remove the door and refit the original fridge with another new front freezer door and also the drawer inside the freezer also did not roll smoothly. So he brought in the new fridge and attempted to put its freezer drawer back on but this too was unsuccessful. But the freezer was able to be closed so all my frozen meats etc could be stored in the freezer. He then contacted Appliances Online and reported to them the issues he had with the freezer drawer. They then decided to send another new replacement fridge freezer. So for the 3rd time I had to wait around for another Westinghouse French Door fridge to arrive. This new fridge freezer arrived 29/1/2018. Once again the handle feel off on the freezer drawer and scratched the stainless steel. I rang to say this has happened yet again and appliances on line said they would send a technician to replace the stainless steel freezer door. He would come from Nerang Wholesale Appliances. The next day I received a call from Nerang Wholesale Appliances a woman from the service section. This woman is THE Rudest, most inconsiderate person I have ever dealt with. She shows absolutely no empathy towards any customer. She said a technician would call me to say when he would come to investigate the problem with the fridge. She had booked him in to come on the Monday morning. I said as I have already waited around for 3 days I could not be home until after 2pm on this Monday due to work commitments. This extremely rude woman then went on to say well that's too bad as this is the only time he can come and if you are not home then its your fault and you would be the one to miss out as he cannot come any other time or day. As you can imagine I was furious with this extremely poor customer service. This woman is the appointment setter, yet has no interpersonal skills and needs to be disciplined and retrained. So I said I can only be home from 2pm on the Monday and she then hung up on me. The technician, James, then rang me on the Monday morning to enquire what was happening. I explained about the stainless steel door on the freezer section and the handle keeps falling off when you pull the freezer drawer out. James said well there is no point messing around and wasting his and my time, he would just order the new parts and let me know when they arrived and organise a time & day when to replace them. About an hour later another technician rang me from Nerang Wholesale Appliances to say he was on his way to check out the fridge. I explained that another technician had already contacted me and he was going to order the new parts. This technician was amazed at this and new nothing of this arrangement and he also happened to mention that the woman in the service section said I said I would only be home between 11.30 am -1.30pm. I can tell you I was Livid! I specifically told the woman I could only be home from 2pm and she defied my request and had the audacity to tell the technician a time I when I said I would not be there. Then finally the parts arrived and this rude woman from Nerang Wholesale Appliances rang to tell me the technician was coming the next day to install the parts. I again explained to her I could not be there on there in the morning until the afternoon. She said this is how the technician works and he will be at the other end of the coast by then so more or less put up with it. She then hung up on me yet again. So the technician eventually did ring me to tell me when he was coming and I again explained I could not be there in the morning. So he kindly said he would fit me in the next day sometime in the afternoon on the Thursday. James the technican arrived and replaced the stainless steel door with a new one and also brought another new freezer handle. But before he left the fridge continuously was beeping and he said this was because the freezer had been open while he had been working on the door and it wasn't as cold as it should be. This comment seemed quite odd as when the new fridge freezers arrived they were hot and never beeped. Well he left with the fridge beeping and the freezer panel inside the fridge flashing. So after half an hour I rang the woman in the service section of Nerang Wholesale Appliances and complained about the beeping. She said just turn it off at the power point and she would contact James to get him to call me. I did not ever receive any calls back. I tried everything to reset the fridge to stop the beeping. I read everything in the book that comes with the fridge and when I tried to reset the panel, a few seconds later it would begin to beep. I turned it off at the power point and made no difference. I rang Westinghouse help line and they also had no solution to stop the beeping. As it was now 4.30 and I again rang Nerang Wholesale Appliances but it went to message bank. I left a message but no-one to this day has ever called me back. Well I put up with the fridge beeping until later that night I rang Appliances On Line and explained about the whole situation and the beeping and the interface panel inside the fridge still flashing. He said he would organise and send another new fridge. I said ok. When we went to bed we turned off the fridge so we could get some sleep from the continuous beeping and made sure the fridge was not open in this excessive summer heat. I already had the contents of the fridge in out and so many times swapping over fridges I was worried about the meat and fish going off and making us sick. I was putting them in esky but with this unusually extreme weather I just had to hope nothing was spoilt. So last Friday the 16/2/2108 another new fridge freezer came in the afternoon. It was installed and the other beeping one which still beeped when turned on again was removed. And yes the handle on the freezer door still comes off but I can now live with this and just open the drawer a particular slow way and the handle only rocks and stays on. As you can see I have been extremely inconvenienced as well as suffering a minor physical injury, having to wait around for deliveries and rudely spoken to on several occasions. 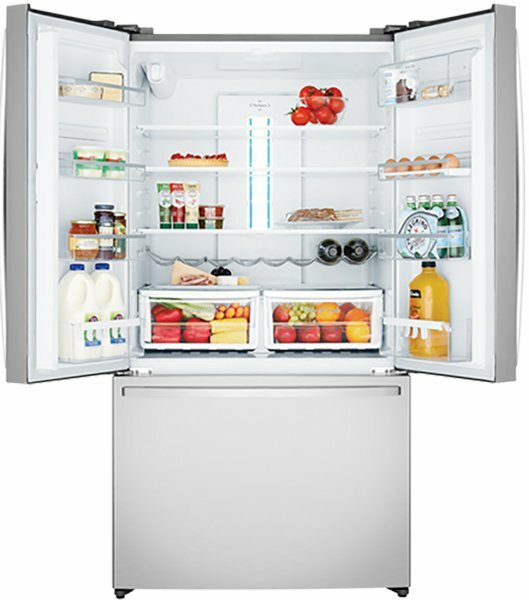 We looked at every French door fridge with a width 850-920mm. Chose this model due to price and design. This model has greater internal depth of shelves for increased storage. 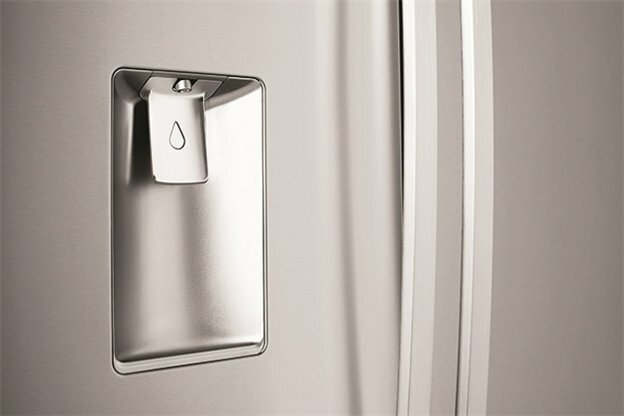 Slimline door with water dispenser maximises internal door storage and adds to sleek exterior. Ice storage in freezer suits us better as the fridge door space is not compromised. Overall couldn't find another model that could compare. I decided on the Westinghouse because of an old frig of my mothers that is over 30years old and still going. I'm very happy with frig great features. Appliances Online service and delivery was excellent. We researched a fair bit, then got an even better deal via the 'online chat'. Good size and fits the space we had available. Great size - makes Ice!! We've had the fridge for 6 weeks and we love it. It fits perfectly in our space. Freezer drawers make access easy. 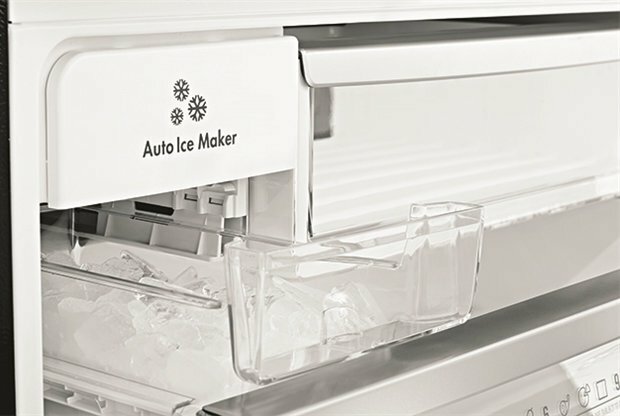 The auto ice maker in freezer not in the door is great and the slim water is great. would buy it all over again.